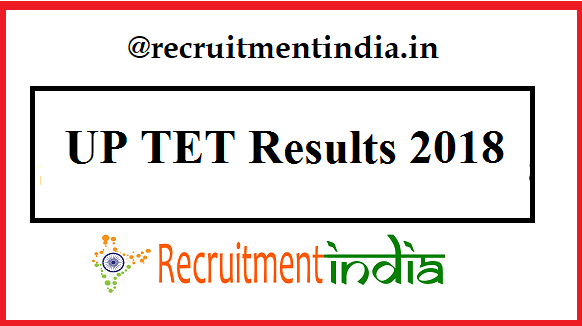 Check UP TET Results 2018 in the official site of TET i.e.upbasiceduboard.gov.in. Within fewer days, the UPTET 2018 Answer Keys are revealed in the official page. You can also check the UP TET Merit list. Know the UP TET 2018 cut -off marks district-wise through the link given in this post. The results will be announced mostly on Dec 2018. Latest Update(21st Dec 2018): UPTET Revised Exam Result Links are provided here. Check the scores. Download UPTET 2018 Result: The contender who wants to join in the government teaching field in Uttar Pradesh state had appeared for the UP TET exam for the year 2018. This TET exam would be conducted by the UP state government recruitment board every year. For thousands of teacher vacancies in all the schools of Uttar Pradesh state will be available. To recruit the perfectly suitable candidates for these huge number of teacher post, a single competitive exam is decided by the officials to check the ability of the interested candidates. So all the able candidates have given this recruitment exam on 18th Nov 2018. The official UP TET Answer key of this 18th Nov 2018 exam is released on the official site of UP TET. At last, the applicants of the exam are eager to check the check their UP TET Results 2018, district-wise merit list. Check UP TET Cut Off Marks 2018 here and in that page you can also get the qualified list of candidates in the TET written exam and going to appear before the interview panel of members. The most trusted site to check this UP TET qualified list of candidates is our jobs portal Recruitmentindia.in. Here you can find the daily job updates over the UP TET when they are announced in the official site. Every moment we are making you aware of the recent news that is assembled with UP TET results. The respective UP TET Score Card will be displayed.